An industrial revolution on a minute scale is taking place in laboratories at The University of Manchester with the development of a highly complex machine that mimics how molecules are made in nature. The artificial molecular machine developed by Professor David Leigh FRS and his team in the School of Chemistry is the most advanced molecular machine of its type in the world. Its development has been published in the journal Science. The machine is just a few nanometres long (a few millionths of a millimetre) and can only be seen using special instruments. Its creation was inspired by natural complex molecular factories where information from DNA is used to programme the linking of molecular building blocks in the correct order. The most extraordinary of these factories is the ribosome, a massive molecular machine found in all living cells. Professor Leigh’s machine is based on the ribosome. It features a functionalized nanometre-sized ring that moves along a molecular track, picking up building blocks located on the path and connecting them together in a specific order to synthesize the desired new molecule. First the ring is threaded onto a molecular strand using copper ions to direct the assembly process. Then a “reactive arm” is attached to the rest of the machine and it starts to operate. The ring moves up and down the strand until its path is blocked by a bulky group. 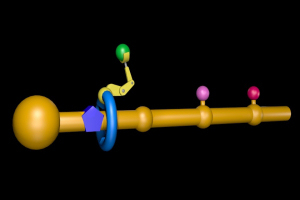 The reactive arm then detaches the obstruction from the track and passes it to another site on the machine, regenerating the active site on the arm. The ring is then free to move further along the strand until its path is obstructed by the next building block. This, in turn, is removed and passed to the elongation site on the ring, thus building up a new molecular structure on the ring. Once all the building blocks are removed from the track, the ring de-threads and the synthesis is over. A short video that illustrates the machine and how it works is available from the press office. It can also be viewed on the university’s YouTube page here. Professor David Leigh is available for interviews on Friday 11 January. The paper “Sequence-Specific Peptide Synthesis by an Artificial Small-Molecule Machine” will be published in Science on Friday 11 January.